Any truly great golf course has a brilliant finishing hole and Concord is no exception. Maxing out at 526 yards and down hill, eighteen is a beautiful par five which can make or break your round. 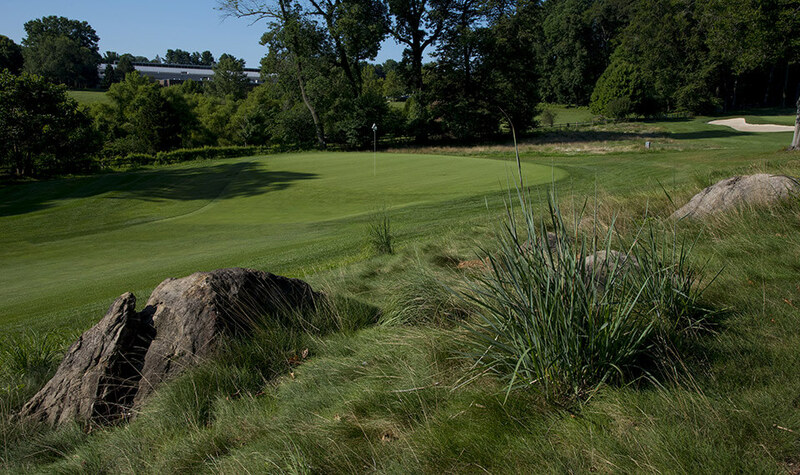 The tee box yields beautiful views of the clubhouse and surrounding holes. 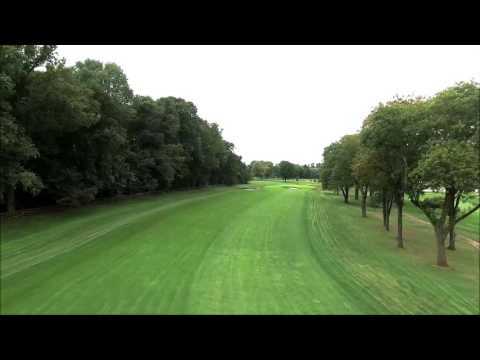 Your tee shot plays slightly downhill and hitting the tree lined fairway could leave you a shot at getting home in two. A landing area bottlenecks around the 100 yard marker and is guarded by two lakes and a stream across the fairway. Most players elect to lay up short of them leaving more or less a 100 yard approach. The green is outlined by a series of narrow bunkers on all sides which make getting up-and-down no easy task. Hopefully your short game will be sharp enough to impress the onlookers eating lunch on the back patio. Number seventeen is a risk-reward par four. Playing at just over 300 yards, a well-struck drive can leave you no more than a wedge in, but a slight miss and you will more than likely be in one of four fairway bunkers. A set of two guard the right side at 200 yards from the tee, and the others guard the left at 250. Many players take the safe route to the left, leaving them a short to mid iron approach. Accuracy is also a must on your approach; three high-lipped bunkers will surely test your sand game should you have the misfortune of missing the green. Seventeen green can look intimidating due to its large size, but it is in fact pretty flat. 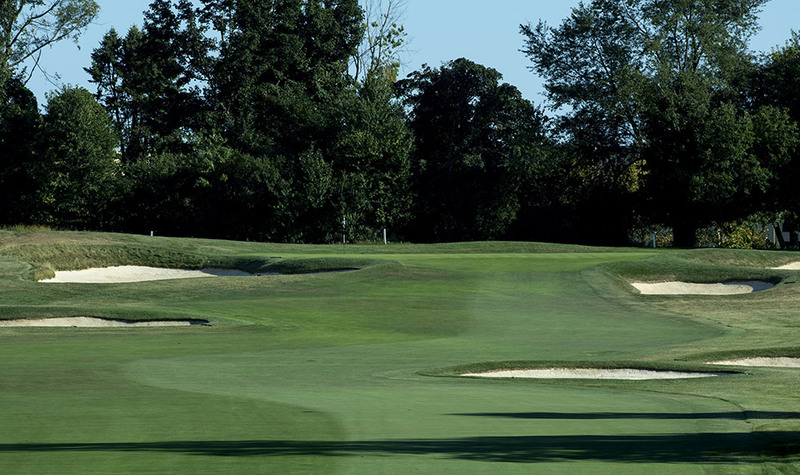 A safe iron to the middle of the green will always yield a respectable run at birdie. 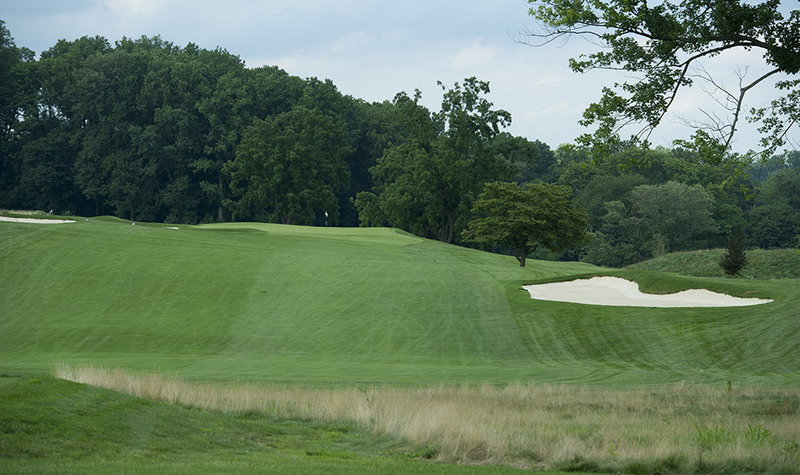 The longest par four on the course, number sixteen is a favorite among many of the members. With a slight dogleg right, this hole has a very generous landing area which puts you at ease on the tee box. 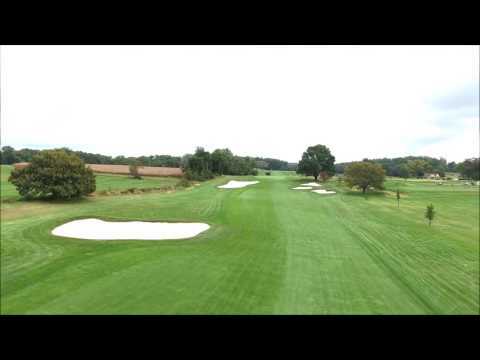 A good drive will leave you a long iron or fairway wood to a tricky green complex. A very wide, yet shallow green with a false-front and a run-off in the back, is very hard to hit in two shots. As if that weren’t enough, a very deep pot bunker sits directly in front of the green prohibiting balls from running up. Most members try to chase a ball up the left side of the fairway, which will easily kick down towards the center of the green, which slopes left to right. 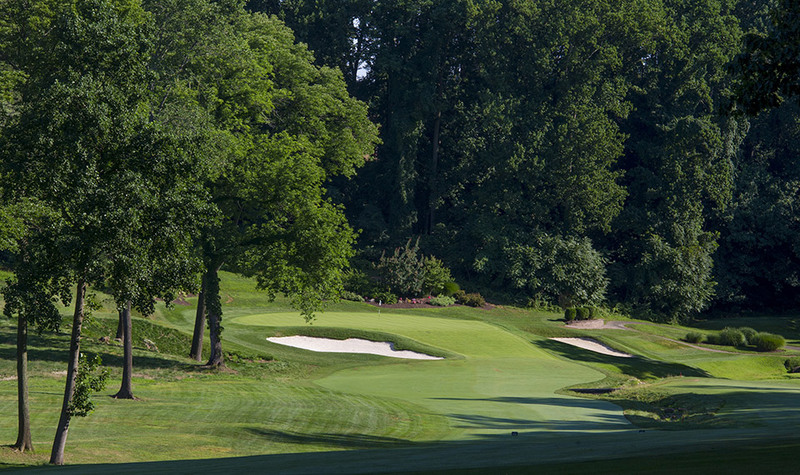 The final par three at Concord, number fifteen is a classic William Flynn hole. Playing approximately 160 yards, fifteen requires an accurate mid-iron to avoid bunkers left and front right of the green. Distance control is also important, due to a large ridge running through the green splitting it into two tiers. Having to navigate the ridge with the putter can force a three-putt for even the advanced player, while a shot kept on the proper level could yield a great birdie. 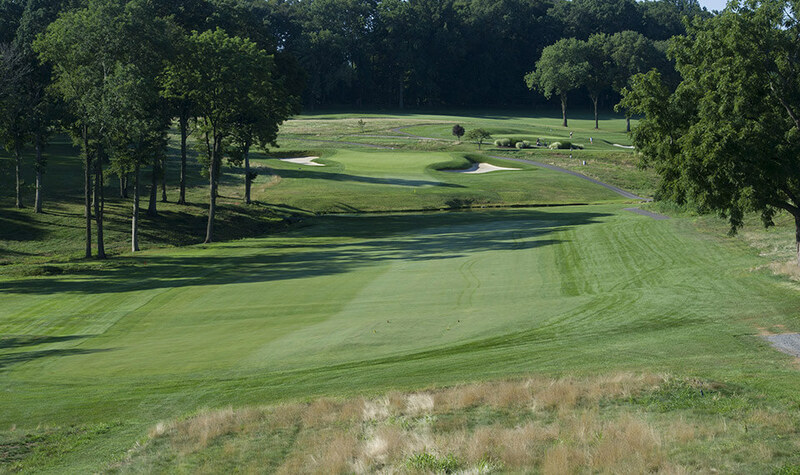 The toughest of our three par fives, number fourteen is certainly a three shot hole. Opening with a tee shot over a small pond, fourteens fairway stretches up a rather steep grade to a slender landing area guarded left by two fairway bunkers. Your second shot plays downhill and is all about distance control. A proper second shot will put you at the 90 degree corner of a right dogleg which will leave you with a wedge or short iron to the green, protected short and left by a large sandtrap. Fourteen’s green seems relatively flat, but actually has a good amount of grade sloping back to front, thus making putting quite tricky. 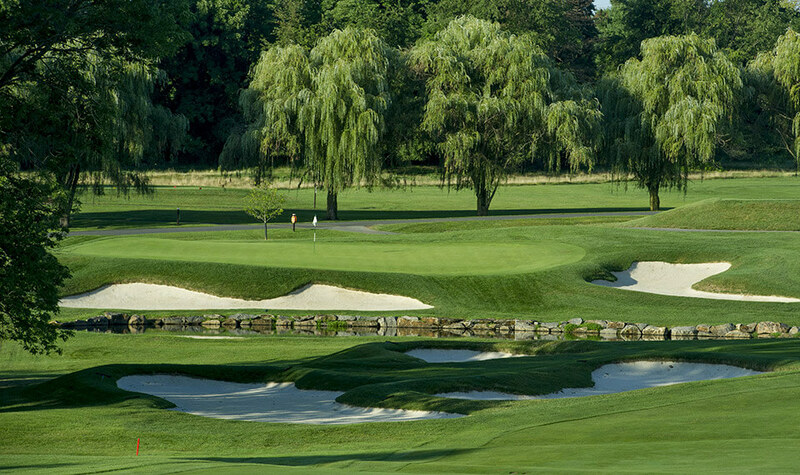 Escape this hole with a par and you have hit five great golf shots. 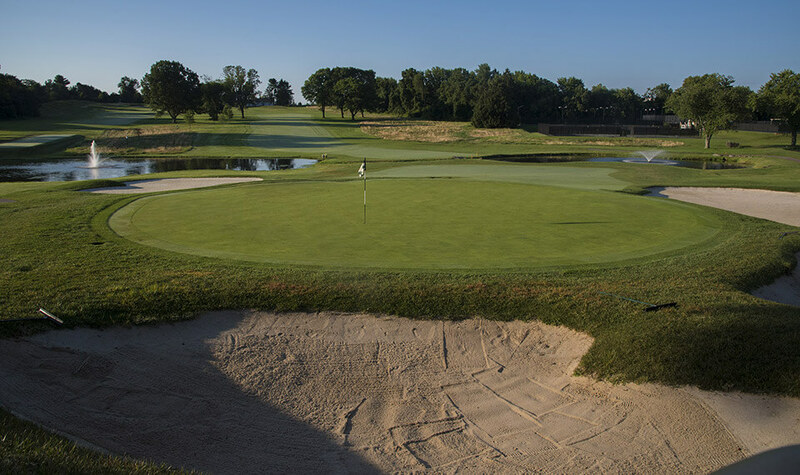 Our signature hole at Concord, number thirteen is as fun to play as it is to gaze at. Playing downhill and sloping right to left, the fairway works itself through a beautiful backdrop of hardwoods. A small brook bisects the fairway, splitting it into upper and lower halves. The right side, or upper half, is the more popular, safer route. The left side, or lower half, requires a longer drive, but will provide the golfer with a much flatter lie and better angle into the green. 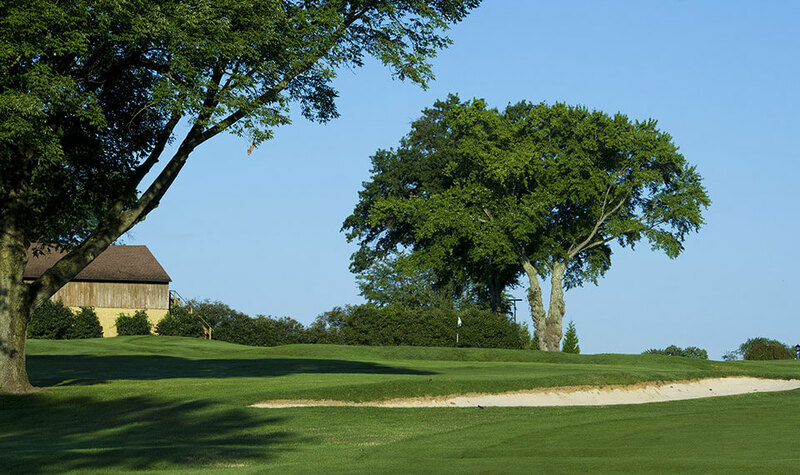 Your approach shot into a classic William Flynn push-up green must navigate bunkerage both right and left and a steep, closely-mown grade leading up to the green. Behind the green is an artfully landscaped embankment with beautiful flora. While it is easy on the eyes, chipping down the hill is not easy on the scorecard, so distance control on your approach is imperative. It’s always a good idea to play for the heart of the green, which will leave you a manageable putt regardless of the pin position. 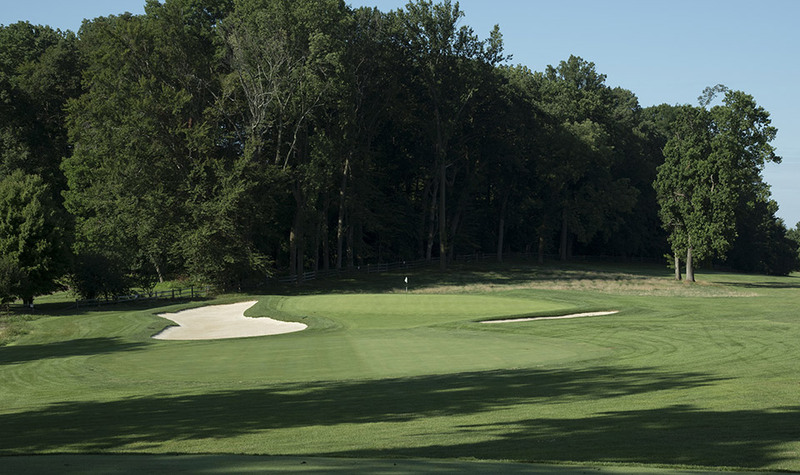 One of the toughest holes at Concord, number twelve is a par four stretching up to 448 yards. A three-tiered elevated tee box yields stunning views of a very generous fairway. The fairway caps off at 100 yards from the green, where a small pond waits to penalize mis-hit approach shots. Many members elect to lay up short of the pond with their second, due to a steep incline of 60+ feet rising up to the green. 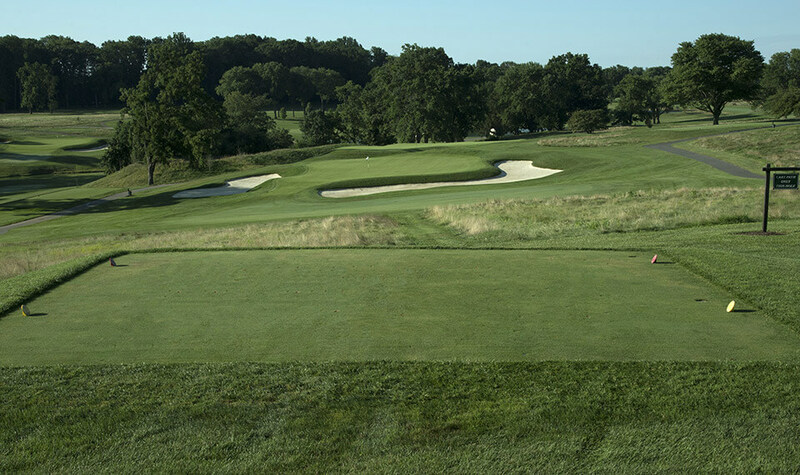 Twelve’s green is closely protected by bunkers right and left, and a steep false front will reject incoming approach shots without proper distance control. A very large green sloping back to front is never a guaranteed two putt. Many are happy to leave this hole with a bogey five, which is par for the Ladies. A very demanding par three, number eleven will test golfers of all skill levels. Playing uphill, this tee shot requires 2-3 clubs extra due to the severity of the slope and the forced carry to clear the trouble short of the green. A large bunker short left and a slippery false front, demand your tee ball to carry to the center of the green. Another cavernous bunker sits along the right of the green to collect balls heading toward number twelve tee box. Eleven’s green has a large shelf on the left side which makes for some of the most exciting pin placements at Concord. Playing at only 330 yards, number ten is a short, yet demanding par four. Two fairway bunkers left and one on the right, edge a rolling fairway which slopes excessively left to right. Keeping your drive left is crucial, for if you do go right and happen to fly the bunker you have deep rough and fescue. A narrow and long green makes club selection crucial and accuracy a must. 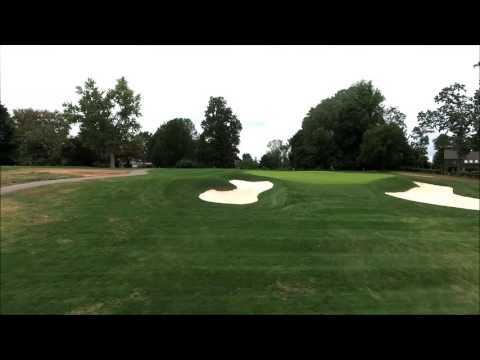 Should your approach miss right, a 15 foot bunker will surely test your sand game. Much like the fairway, the green slopes left to right, making it very difficult to nestle an approach next to the hole, even with a wedge. Number eight is a visually stunning holes. From the tee box you have beautiful views of not only number 8, but also #’s 7, 9, 10, 11, and 12. Playing downhill at 175 yards, birdie is not impractical with a solidly struck iron. This downhill beauty sports an undulating green sloping back to front which is protected by bunkers on three sides. Keep your approach below the hole and you will have a good run at birdie. A very demanding par four, number seven is one of our best holes. Stretching up to 458 yards and playing as a par five for the Ladies, this hole will truly test all aspects of your game. The uphill tee-shot is framed with O.B. left and trees right. A good drive will crest the top of the hill to find itself in great position to shoot for the green. The rolling fairway climbs to a green sloped back to front, left to right, with a deep bunker guarding the front right of the green. 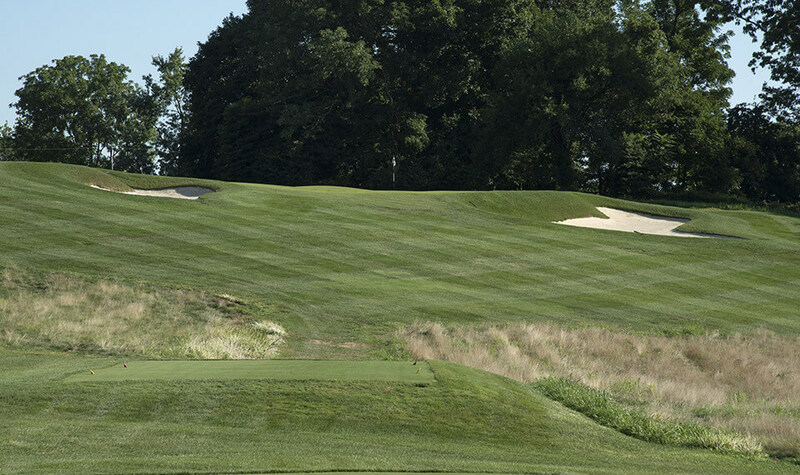 Due to the length of the hole most players choose to run it up the left side, which feeds toward the center of the green. This hole is truly one of Concord's’ finest. The first of three par fives, the sixth is unquestionably a three shot hole. 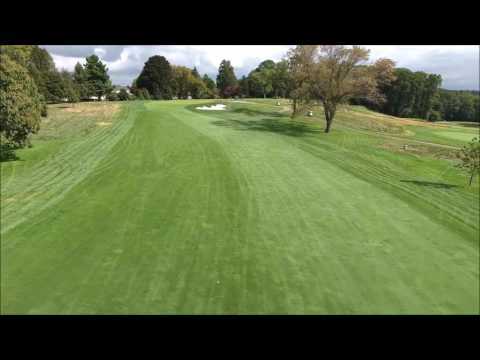 Your tee shot is uphill to a generous and rolling fairway. 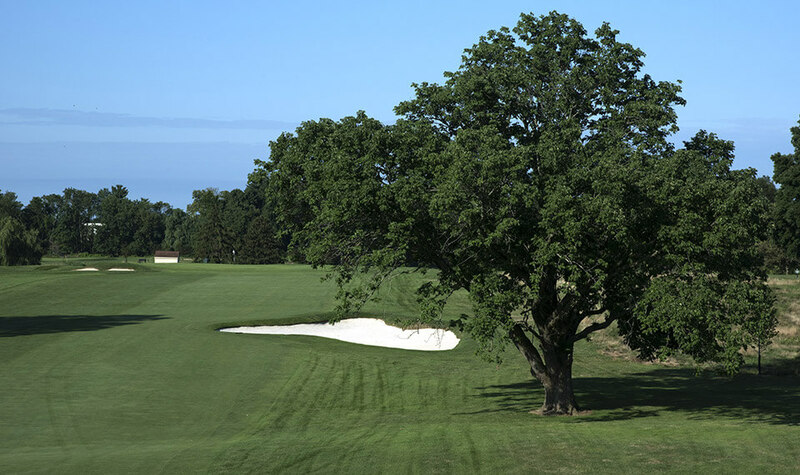 A small grove of trees lines the left side of the fairway and will protect wayward tee shots from sailing O.B left. A layup to the 150 yard marker will leave you plenty of fairway to work with, but to get any closer will take a precise shot, for the fairway bottlenecks with treacherous bunkers left and right. Any miscue here will leave you a 100+ yard bunker shot which will always be challenging. Your third shot is slightly uphill to a large and undulating green which gradually slopes left to right. With proper execution and distance control, a birdie is a good possibility. A challenging par four, hole number five requires both accuracy and distance off the tee. A dogleg left, the fifth fairway is protected by a large pond which hugs the left side of the fairway and a large grove of pines and hardwoods which encompass balls missed to the right. Any tee ball missing the fairway will usually result in a lay-up, attributed to another small pond which butts-up to a very shallow green. With O.B. no more than ten yards off the back of the green, distance control on your approach is crucial, yielding one of the most demanding shots on the course. The first of the par threes, the fourth is a straightforward hole with beautiful views. 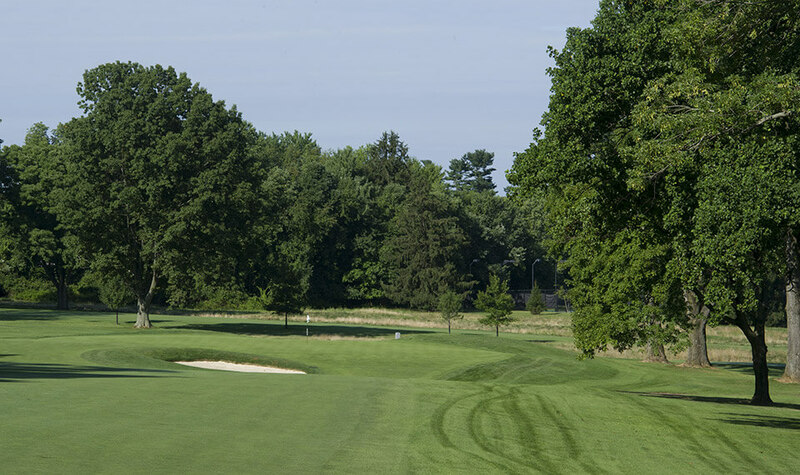 The elongated tee box is lined by Concord’s signature weeping-willows, but the green is in the open and susceptible to wind gusts, so be careful with your club selection. The fourth green is very large and surrounded by bunkers right and left to catch stray shots. A turtle-back green can make putting quite difficult, so it’s always a good idea to examine your putt from several angles to ensure a good read. The third hole is a mid-length par four which really puts a precedent on your tee shot. With bunkers protecting both sides of the fairway, accuracy is a must. A good drive will leave you a mid to short iron over a pond to an elevated, bowl-shaped green, sloped from back to front. Experienced players will try to leave their approach shots short of the hole for an uphill birdie putt. If you find yourself missing the green, remember everything breaks toward the pond! One of the risk-reward holes with just over 300 yards in length. With a large fairway bunker protruding into the left side of the fairway, most golfers elect to lay up short with a long iron or fairway wood. Selecting driver will bring a series of three bunkers down the right side into play, but hit correctly will leave you nothing more than a wedge to the most demanding green on the course. 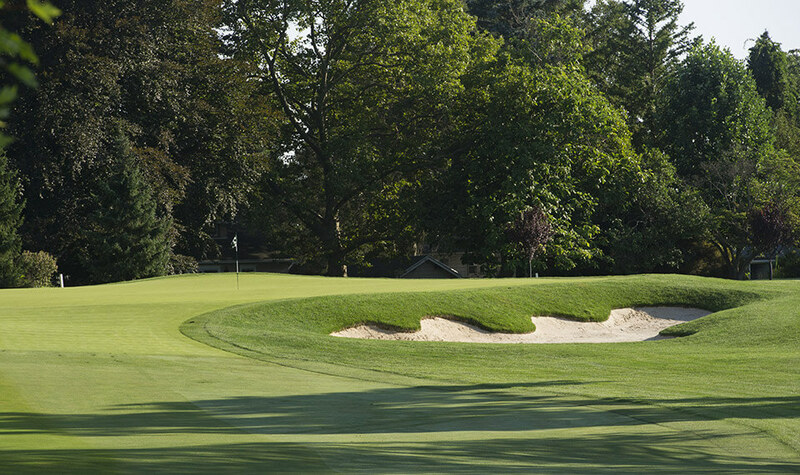 Heavily pitched from back-to-front, the second green is guarded by three bunkers. The best option is always below the hole, as a shot past the cup will leave you a challenging downhill putt. Don’t let the yardage fool you, walking away with par will please a golfer of any skill level. A beautiful opening hole, this par 4 has a generous fairway guarded by a pond on the left. Off the tee box, a safe drive to the right will leave you a long iron or fairway wood to the green. 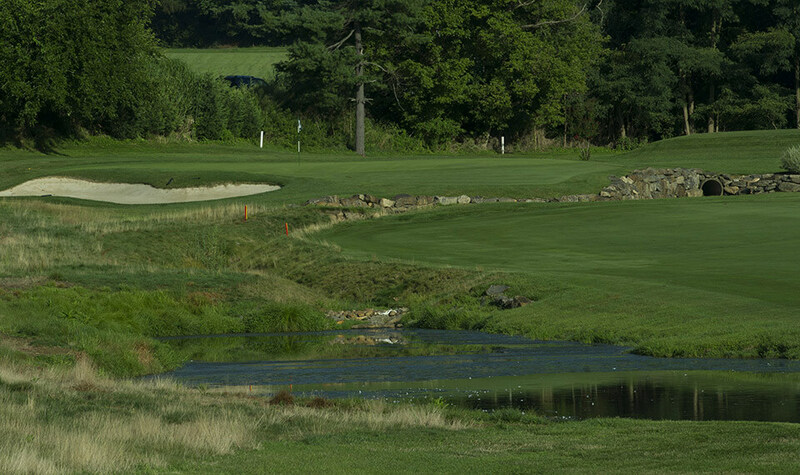 A more aggressive drive down the left side will generally always leave you a short iron to the green, but will definitely bring the pond into play. The first green is elevated approximately fifteen feet and heavily guarded by deep bunkers both right and left, bisected by a severe false front. 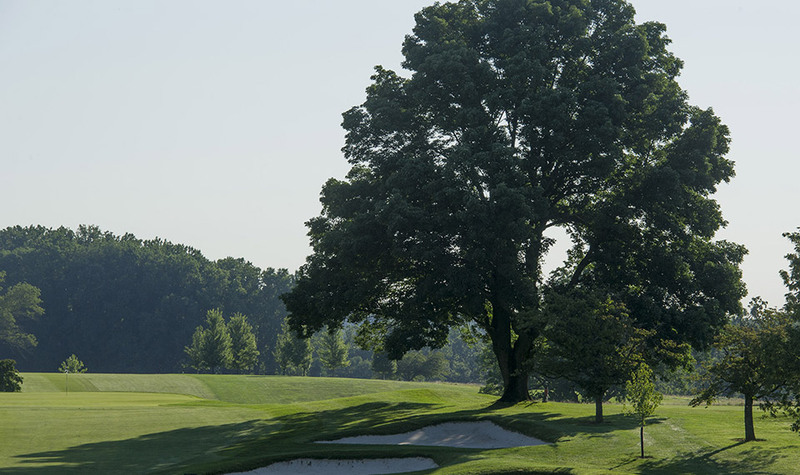 A towering approach to the middle of the green will set you up for a par and a great start. Originally designed and built in 1927 by William Flynn, CCC was renovated by Ron Forse in 2001, creating new challenges and versatility. 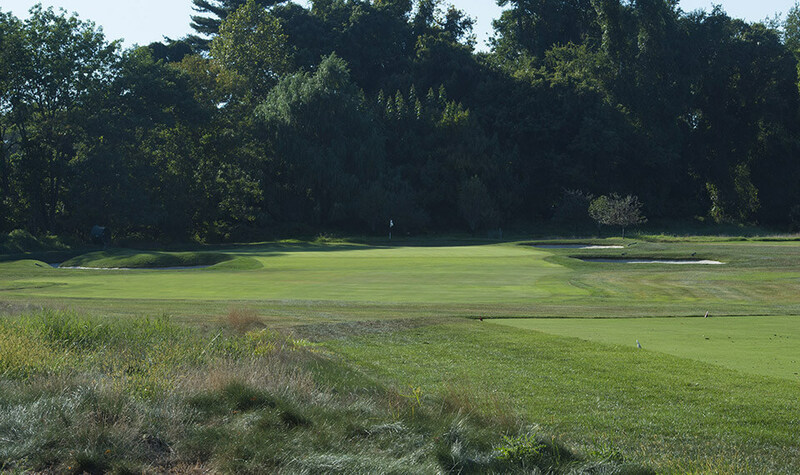 CCC is rated as one of the finest golf courses in all of the Delaware Valley. The practice facilities include a putting green as well as a full driving range and separate area for your short game and sand trap practice. The following pages will show you a picture of each hole and how the hole should be played.